Sorry for the past two weeks of not posting. School has been on break and I really haven't had the chance to extensively use a pencil. This week between filling out my planner for the semester, taking notes at various back to school meetings, and making checklists for college transfer I finally was able to form an opinion on my latest pencil, the Cedar Pointe #1. General Pencil Company's Cedar Pointe #1 had been pulled out of production for about a year when pencil fanatics (ahem Erasablers) petitioned to have the pencil put back into production. 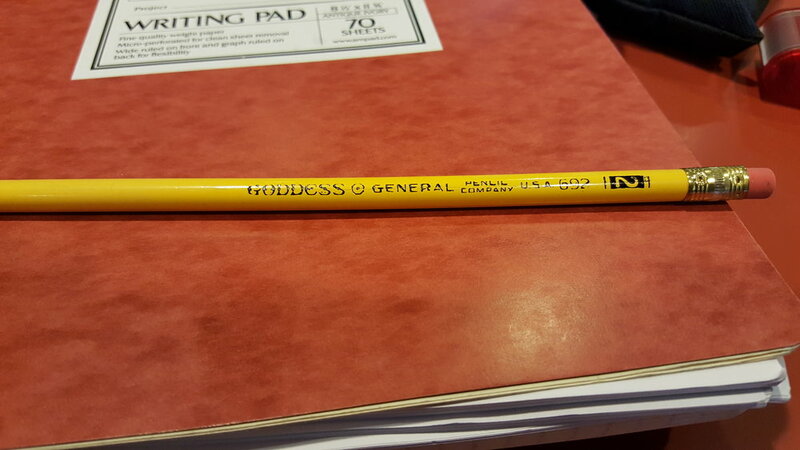 Not only do I love the General responds to customer input, but the fact that they still manufacture the pencils right here in the US is a bonus (double bonus is that they are located in my home state of NJ!). The Cedar Pointe #1 is a lot smoother and darker than its 2HB counterpart. It has an all natural finish with a black ferrule and eraser. The Cedar Pointe #1 sharpens nicely and retains its point quite well since the graphite is a bit softer and darker than its 2HB cousin. The eraser that comes on the end of the pencil is useful and while it leaves quite a bit of dust, it erases evenly and cleanly. My only complaint really, and this is something easily remedied, is that it smears a bit and transfers to the opposite page when writing in a notebook. One could very easily use a sheet of paper in between pages while writing, but for someone like myself constantly jotting down notes and lists, it is just not feasible to use this on projects that require no smear.